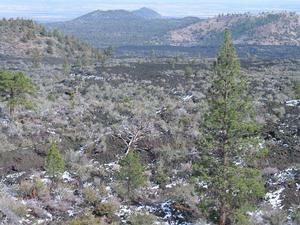 Located about 30 miles south of the Oregon border near Tulelake, CA, the Lava Beds National Monument is an incredible display of hardened lava from ancient volcanic eruptions. The Monument is also a site of historical significance: it was the site of one of the last Indian wars in the west: the Modoc Indians held off the US calvary for months until they were finally captured. There are a number of historical markers in the area that allow visitors to follow the battles. The Monument also has hundreds of caves. Many are open for exploration. The first time we visited the park, it was by accident. We had been driving north of Medicine Lake, when we suddenly found ourselves on an isolated back entry road that allowed access into the park. Amazingly, there was no entry gate or anyone around to collect the entry fee. We thought we were really clever at having entered the park for free. Later, we found out that you have to show your proof of payment when you exit the park on the North Side, and that is when you are expected to pay. I guess we had bad karma at that point, because we handed the toll collector a $20 dollar bill, but later realized as we were driving away that we were never given any change. We immediately spun around and went back, and luckily the skeptical lady gave us back our change. The panoramas and viewpoints allow you to see from one horizon to the next at some view points. It’s also very hot….we visited the park in August and the temperatures were nearly 97 degrees Fahrenheit, and extremely dry. I would advise not visiting in the months of July and August. If you’re into exploring caves, you’ll love this park. There are a number of lava tube caves that are accessible by the public. There are camping spots available in the park, but I found these to be extremely dry and uncomfortable because of a lack of shade. If you are planning a trip, I would advise exploring the monument during the day and camping elsewhere. I agree with Preichow with only one exception. Yes, the camping can be warm. This is not the type of park where one stays in camp all day. One can go “subterranean” during the heat of the day, exploring the many cool lava tubes. As I recall, the temperatures down below are a constant – in the 55 -57 degree range. An end of the day a visit to their very nice air-conditioned visitor center can lengthen your time spent in cool environs by another 30-60 minutes. By this time, it will be Happy Hour. There are bound to be long shadows over your campsite where you can retreat to cool libations before dinner. I’m an extremely heat sensitive individual and was able to survive quite nicely following this regimen.